Hi, my name is Leanne Strong, I’m 24 years old, and I have a very mild form of autism known as Asperger’s syndrome. 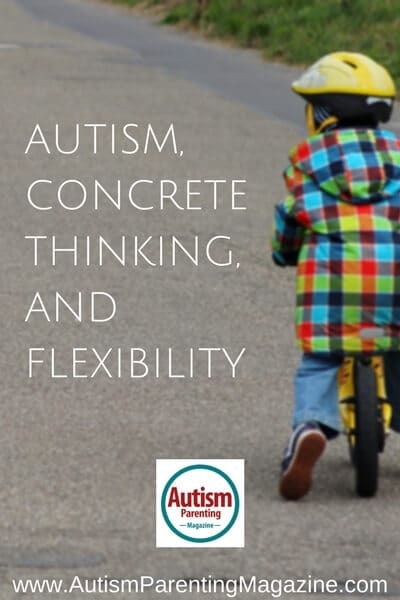 Many people on the autism spectrum have a very concrete way of thinking. Many of us have difficulty understanding when someone is joking or being serious, or when certain “rules” don’t need to be followed. Adam notices a fellow student who has more severe special needs playing a video game geared toward children who are a few years younger. Adam tells the student, “You’re too old for that game—that game is for younger kids.” That student and many witnesses might think Adam is saying this just to be mean, but he most certainly is not trying to be mean AT ALL. Because of his autism, Adam likely doesn’t understand how what he says or does makes other people feel. In fact, Adam might not understand how his statements could possibly hurt the other student’s feelings. He also has difficulty understanding when certain “rules” don’t need to be followed, as many people on the autism spectrum do. Luke hears Kevin talking about the public school district where his son will be starting kindergarten in the coming fall. Luke says to Kevin, “I wouldn’t send my kids to school there—that school district is bad.” Kevin (and many witnesses) might think Luke is trying to make him feel bad, but that most certainly is NOT Luke’s intention. Luke is on the autism spectrum. He likely does not understand how what he does or says makes other people feel. In fact, he might not understand how his words could POSSIBLY hurt Kevin’s feelings. Like many people on the autism spectrum, Luke prefers to tell people as it is (or as he has heard) rather than beating around the bush. Autumn overhears another kid telling the lunch ladies, “Give me some lasagna,” instead of, “May I have some lasagna, please?” Autumn tells this kid, “You should know by now that you need to say please.” That kid and many witnesses might think Autumn is just trying to make the other kid feel bad, but she most certainly is NOT trying to make the other kid feel bad AT ALL. Autumn is on the autism spectrum. Adults and older kids have taught her from an early age to say “please” and “thank you,” and she may not be aware that this kid may not have been taught this. One time, near the end of ninth grade, a teacher said something to me that hurt my feelings. Later, when I told her that what she said hurt my feelings, she explained why she said it instead of apologizing. I was very mad at her, and decided that I DID NOT like her. This was because I remembered how adults had always taught me to say “I’m sorry” if I hurt someone’s feelings, and I didn’t realize that this teacher might not have been taught this. I also did not realize that the “rules” don’t always need to be followed. If I was at the park, and a kid I didn’t recognize asked me to play with them, I would say “NO!” That wasn’t because I really didn’t want to play with that kid (like you would think): it was because I remembered how adults had always taught me to say no to strangers, and I didn’t understand that sometimes the rules don’t need to be followed. Temple Grandin (a noted professor, author, and speaker who just so happens to have autism) wrote an article in which she mentions mixing black and white paint to illustrate the theory, but you can use whatever colors you want. You can use the different seasons. Spring and fall are the “gray” areas in between summer and winter. Spring is when everything starts to grow, the flowers start to bloom, and the air outside starts to get warmer. Fall is when the air outside starts to get cooler, and the leaves gradually turn color and fall off the trees. Sometimes early spring still feels like winter, and sometimes late spring already feels like summer. Sometimes early fall still feels like summer, and sometimes late fall already feels like winter. You can use the different times of the day. Sunrise and sunset are the “gray” areas between daylight and darkness. The next time your child goes outside to wait for the school bus, have him/her watch the bus’s warning signals. If the bus’s yellow lights are flashing, that means kids will be getting on or off soon. All other vehicles on the road should be ready to stop. If the bus’s red lights are flashing and the bus’s stop sign is out, that means kids are getting on or off right now. By law, all other vehicles on the road must stop, and may not go again until the stop sign closes and the red lights turn off. Show the person a traffic light (this should be easy to do while you are in the car or on the bus), and explain what the different colored lights mean. If the green light is on, that means go/keep going. If the yellow light is on, that means proceed with caution (slow down and be ready to stop if you need to). If the red light is on, that means STOP! If the light has an arrow, and it is on, that means it is only safe/unsafe to go in this direction. Leanne Strong was born in late June of 1993, in Rochester, NY. She was her parents’ firstborn child. Around age two or so, right after Leanne’s brother was born, her parents noticed that something was different about her. They took her to a doctor in Rochester who specializes in neurological disorders. Leanne was then diagnosed with a language disorder. After further testing, she was diagnosed with a form of autism that was then called PDD-NOS (pervasive developmental Disorder – not otherwise specified). Leanne’s parents felt that their daughter met more of the criteria for Asperger’s syndrome. She was an early talker, and most of her early cognitive milestones were within normal limits. When Leanne was 15, almost 16, her parents took her to another doctor at the same place where she had gone for her original evaluation, and that doctor agreed that Leanne met enough criteria for an Asperger’s syndrome diagnosis. Leanne now wants to shed some light on how to help other people on the autism spectrum.